I wrote the other night about Jennifer Egan’s A Visit from the Goon Squad, which I finished two weekends ago. Between that and Chad Harbach’s The Art of Fielding, I had taken an excursion into recent American fiction, a welcome break from my non-fiction journeys through Eastern Europe and Central Asia. But perhaps it was time to get back overseas. Where to? Well, it’s not like I have any particular plan or program. I seem to have fallen into this sequence of books, each suggesting another to read or a region to explore. In retrospect, it started three-and-a-half years ago with Judith Herrin’s Byzantium: The Surprising Life of a Medieval Empire. Then there were the books I read two winters ago: Ian Frazier’s Travels in Siberia, Ted Conover’s The Routes of Man: Travels in the Paved World, Peter Hessler’s Country Driving: A Journey Through China from Farm to Factory, Eliza Griswold’s The Tenth Parallel: Dispatches from the Fault Line Between Christianity and Islam. It took almost another year, and my reading of Max Egremont’s Forgotten Land: Journeys Among the Ghosts of East Prussia, before a theme began to emerge. That led to Timothy Snyder’s Bloodlands: Europe Between Hitler and Stalin, Orlando Figes’ The Crimean War, Colin Thurbon’s Shadow of the Silk Road, Thomas de Waal’s The Caucasus, Charles King’s Odessa: Genius and Death in a City of Dreams, Edmund de Waal’s The Hare with Amber Eyes , and the realization that I was reading books about the border between Europe and Asia, Christianity and Islam, Communism and Fascism, Medievalism and Modernism. And the people caught in the middle, millions of whom were dislocated, starved, or murdered. In finishing the Crimean War history and moving from the Black Sea eastward to Central Asia and the Caucasus, I could just as well have headed west to the Balkans. Two weeks ago, I decided to do so. But no book immediately suggested itself. Or rather, two did: Misha Glenny’s The Balkans: Nationalism, War and the Great Powers, 1804–1999, 726 pages long, and Mark Mazower’s The Balkans: A Short History, 188 pages long. I couldn’t help thinking that a book of intermediate length might be more suitable. Both books are over a decade old. When they were new, Richard Crampton reviewed them in the New York Review of Books, praising them both. I chose Mazower, in part because it is available on the Kindle, while Glenny’s isn’t. I was slow to get into it, and began to fear it was going to be the longest short book I ever read. One initial difficulty I had is that Mazower assumes a fair bit of familiarity with the basic historical and political facts. I seemed to be reading commentary, without being told what book this was commentary on. Not that I am all that ignorant of the facts, but to the extent that I am ignorant, he wasn’t filling me in. This obstacle was only temporary, and soon I was absorbed. Mazower will not accept that the awful violence the peninsula has endured is the result of ancient ethnic hatreds. It was, he argues, the only means modern nationalists could find to break apart a society that was otherwise capable of ignoring the mundane divisions of class and ethnicity. Like Glenny and Allcock he sees nationalism as a Western or Central European import into the Balkans; and if this import gave the Balkans the categories with which its peoples defined themselves, so it gave them also the ideological weapons in the shape primarily of modern romantic nationalism with which to destroy themselves. Mazower, like Glenny, also shows how romantic, European-style nationalism was given its political opportunity by peasant anger at declining living standards. [Mazower] produces a masterful and wonderfully succinct picture of the Ottoman Empire in the earlier centuries of its rule in Europe. It was an empire which was amazingly polyglot, especially in its capital. It may not have accepted religious equality—which was almost coterminous with ethnic equality—but it practiced tolerance and accepted coexistence. Despite the lurid pictures of Muslim persecution painted by many nineteenth-century European Christian observers or commentators, there was a great deal of intermixing in the Ottoman Empire. Muslims, Orthodox Christians, Jews, and others became members of the same guilds, and would even, in nineteenth-century Salonika, for example, join the same labor organizations or gentlemen’s clubs. 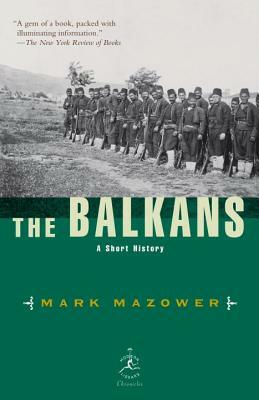 Those who already know something of Balkan history will be delighted by Mazower’s sober judgments, his measured style, his breadth of knowledge, and his telling anecdotes. For those who as yet know little of this history there could scarcely be a more reliable or a more appetizing introduction to it than Mazower’s book. I closed the book last weekend eager for more. And what do you know? A new edition of the Misha Glenny book that I rejected in favor of Mazower is coming out in late September. The new title will be The Balkans: Nationalism, War, and the Great Powers, 1804–2011, and unlike the original, this one will have a Kindle version. It should be worth reading. In the meantime, there’s Mazower’s Salonica, City of Ghosts: Christians, Muslims and Jews 1430-1950. Crampton has a piece in the New York Review of Books on that too. It sounds wonderful, with an examination of the same themes that his Balkans introduction treated, but with the greater depth made possible by a longer book and the focus on a single city. And once again, in keeping with a thread that has run through several of the books I’ve read, I can learn about the growth and destruction of one of the great Jewish communities of Europe. I have downloaded it. More once I’ve read it.